Figure 1. Example of endograft geometry over 44 months of EVAR follow-up in a patient treated for endograft migration at 4-year follow-up. Green denotes the pre-EVAR infrarenal neck surface, and the post-EVAR apposition surface is shown in yellow. The blue dots mark the left and right renal artery orifices. Full dilation of the 28-mm main body was observed at 1 month, and apposition decreased continuously from 71% (11 mm) to 22% (4 mm) as a result of stent migration and distal effacement. The aneurysm grew slightly from 59 mm to 62 mm. Figure 1 shows how the apposition can slowly disappear, while type Ia endoleak and significant aneurysm growth are not yet detected on standard CTA reports. At 17-month follow-up, significant loss of apposition can be observed, which was the result of combined endograft migration and distal neck effacement. A 28-mm-diameter Talent endograft (Medtronic) was used, which oversized the 27-mm neck by only 4% and may have caused the migration. Loss of apposition at the distal site of the neck often remains undetected on regular CT assessment but is also clearly visualized with the software. Despite seemingly successful deployment of the endograft in this straight, uncomplicated neck, neck apposition decreased from 71% at 1 month to 43% at 17 months. If these scans would have been assessed with the software, intensified surveillance would have been advised. In the first study by Schuurmann et al of 81 elective EVAR patients, the top of the endograft fabric was deployed at an average of 1.4 mm below the lowest renal artery orifice.8 In one-third of patients, the implanted endografts were positioned partially proximal to the lowest renal artery orifice, which did not result in occlusion of the arteries. In 26% of patients, the endograft was deployed at more than 3 mm below the lowest renal artery, which means that a large portion of the aortic neck was not used for seal. At the contralateral side, 4 to 14 mm of aortic neck was not covered. This unused area of the aortic neck could be utilized when the top of the graft is tilted during deployment, which is possible, for example, with the Excluder conformable abdominal aortic aneurysm endoprosthesis (Gore & Associates). There is great need for accurate surveillance of patients who undergo EVAR, as long-term complications may arise at any time during follow-up and may be missed with standard surveillance methods. The results of these studies suggest that a type Ia endoleak does not occur instantly, but is preceded by slow, subtle displacement and expansion of the endograft in most patients.8,9 These subtle changes are often missed on regular CT surveillance but can be quantified and clearly visualized with the dedicated software. By comparing the CT scan at 1 month with a later CT scan, these subtle changes can be detected, allowing for tailor-made surveillance or even prophylactic reintervention. Patients with relatively low deployment of the endograft during the index procedure may be at increased risk for later failure, as there is less remaining margin for displacement without consequence for an effective seal. Future studies should identify the relevant cutoffs for each variable for accurate prediction of late failure. Meanwhile, the vascular image analysis prototype software is being further developed to make it available for clinical use. 1. Patel R, Sweeting MJ, Powell JT, Greenhalgh RM. Endovascular versus open repair of abdominal aortic aneurysm in 15-years’ follow-up of the UK endovascular aneurysm repair trial 1 (EVAR trial 1): a randomised controlled trial. Lancet. 2016;388:2366-2374. 2. Savlovskis J, Krievins D, de Vries JP, et al. Aortic neck enlargement after endovascular aneurysm repair using balloon-expandable versus self-expanding endografts. J Vasc Surg. 2015;62:541-549. 3. Moll FL, Powell JT, Fraedrich G, et al. Management of abdominal aortic aneurysms clinical practice guidelines of the European Society for Vascular Surgery. Eur J Vasc Endovasc Surg. 2011;41(suppl 1):S1-S58. 4. Chaikof EL, Brewster DC, Dalman RL, et al. The care of patients with an abdominal aortic aneurysm: the Society for Vascular Surgery practice guidelines. J Vasc Surg. 2009;50(4 suppl):S2-S49. 5. Sternbergh WC 3rd, Greenberg RK, Chuter TAM, Tonnessen BH. Redefining postoperative surveillance after endovascular aneurysm repair: recommendations based on 5-year follow-up in the US Zenith multicenter trial. J Vasc Surg. 2008;48:278-285. 6. Chaer RA, Gushchin A, Rhee R, et al. Duplex ultrasound as the sole long-term surveillance method post-endovascular aneurysm repair: a safe alternative for stable aneurysms. J Vasc Surg. 2009;49:845-849. 7. AbuRahma AF, Welch CA, Mullins BB, Dyer B. Computed tomography versus color duplex ultrasound for surveillance of abdominal aortic stent-grafts. J Endovasc Ther. 2005;12:568-573. 8. Schuurmann RCL, van Noort K, Overeem SP, et al. Determination of endograft apposition, position, and expansion in the aortic neck predicts type Ia endoleak and migration after endovascular aneurysm repair. J Endovasc Ther. 2018;25:366-375. 9. Van Noort K, Schuurmann RC, Slump CH, et al. A new method for precise determination of endograft position and apposition in the aortic neck after endovascular aortic aneurysm repair. J Cardiovasc Surg (Torino). 2016;57:737-746. 10. Schuurmann RCL, Overeem SP, van Noort K, et al. 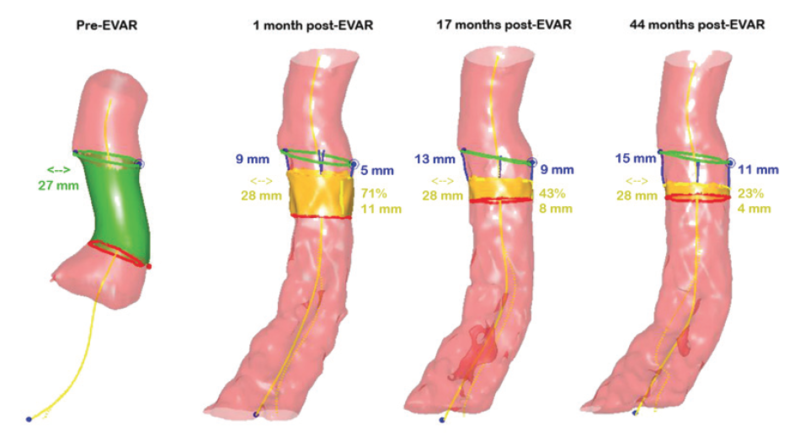 Validation of a new methodology to determine 3-dimensional endograft apposition, position, and expansion in the aortic neck after endovascular aneurysm repair. J Endovasc Ther. 2018;25:358-365. 11. Schuurmann RCL, Overeem SP, Ouriel K, et al. A semiautomated method for measuring the 3-dimensional fabric to renal artery distances to determine endograft position after endovascular aneurysm repair. J Endovasc Ther. 2017;24:698-706. Disclosures: Cofounder of Endovascular Diagnostics B.V.